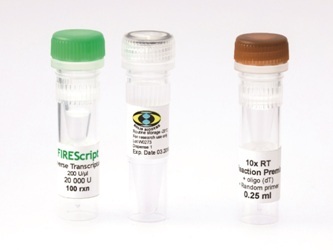 FIREScript RT cDNA Synthesis Mix contains all the reagents you need to synthesize cDNA from just 3 tubes. Its fast reaction speed allows you to perform your synthesis in just 15 minutes while the high working temperature of the enzyme (up to 60 ºC) ensures high yield and great sensitivity. *See product name for corresponding priming method.